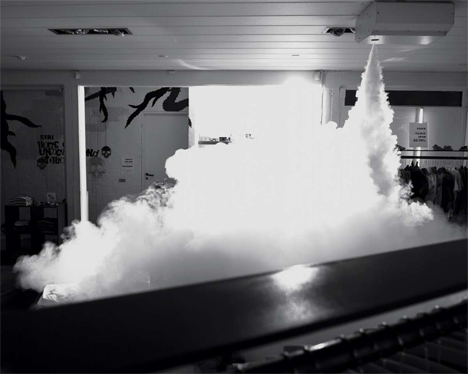 The use of security smoke has deterred crimes all over the world for years. A criminal tries to break in and they are welcomed by a thick cloud of fog that obscures their vision and freaks them out enough to drive them away. It’s a pretty effective deterrent, but its very nature makes actually catching the crooks difficult since any security cameras tend to be rendered completely useless by thick banks of fog. 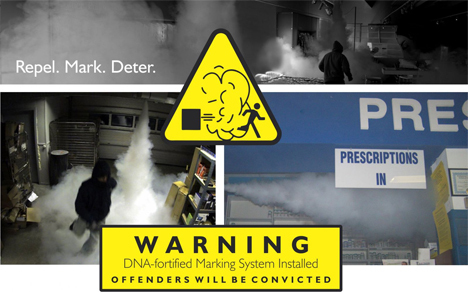 SmokeCloak, a manufacturer of fog security systems, has teamed up with Applied DNA Sciences to create a security fog that actually marks the criminals with distinctive DNA so they can later be caught and identified. The DNA is plant-based and completely harmless; it’s even invisible so the bad guys have no idea they’ve been marked. Each location where the system is installed has its own unique DNA formation, created by cutting up plant DNA and rearranging it. When a suspect is caught, cops perform a simple-ish DNA test and can then prove that the suspect was involved in something shady. The system can also be used to flood a warehouse or shop during non-working hours so that if products go missing, the products themselves can later be identified once recovered. It’s a pretty futuristic take on security tags that’s way more effective than a buzzer going off at the door.